The full horror of 20th century industrialised warfare was nowhere more intense than at Verdun in 1916. A French and German battlefield, it is rarely visited by other nationalities. Considering it is the key to understanding the huge loss of life on the Somme, this is a strange feature of modern battlefield tourism. To the French, Verdun is sacred. A French city since the Peace of Munich in 1648, it survived numerous attempts to capture it, not least during the Franco-Prussian war of 1870-1871. The rich history of Verdun endowed it with mythic status in the French psyche, a fact known to Von Falkenhayn when he launched his siege in February 1916. The German Commander-in-Chief knew that the French would never abandon Verdun and would hurl every soldier at France’s disposal into the furnace he was going to create. His plan was not actually to capture the city, but simply to kill as many Frenchmen as possible. He would ‘bleed France white’. So began one of the most savage struggles of the First World War, one that claimed over a million casualties in under a year. The ordeal of Verdun is even more deeply ingrained in the French consciousness than the Somme is in the British. It was a national struggle, a battle for the survival, the honour, and the sacred heart of France. The modern, industrial nature of the weaponry used in the Great War meant that the landscape was changed forever; modern warfare creates as well as destroys. 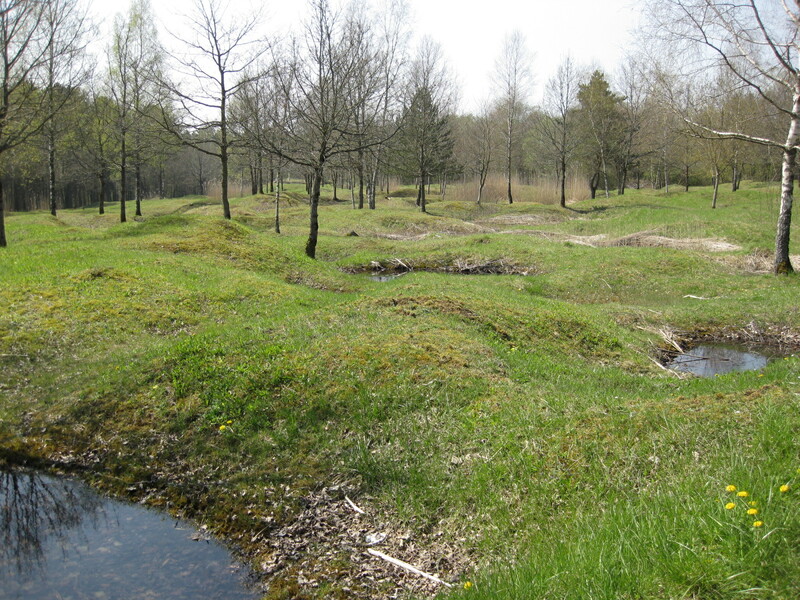 Landscape is transformed, and this transformation can be seen in its most extreme forms at Verdun. Even today, much of the surrounding area is still off limits to the public. Millions of unexploded shells still litter the forest floors. Signs exclaiming INTERDIT VERBOTEN FORBIDDEN are commonplace, and unlike elsewhere on the Western Front, visitors pay attention to the warnings. Damaged landscape of the Verdun battlefield. Photograph by Matt Leonard (CC-BY-NC-SA). In parts, the earth was so shattered by high explosive, poisoned by toxic gas, and infected with thousands of rotting corpses that even today it will not bear life. The ground is simply grey, and it is doubtful whether anything will grow there again. Everywhere, the brutal scars of war are visible. But there is one place in particular that stands out in this vast area of murdered nature: the Butte de Vauquois. The Butte de Vauquois is located about 15 miles from Verdun. Before the war, it was a large hill some 290m high. At its peak was the small village of Vauquois, a peaceful place where 170 or so inhabitants quietly went about their business. By the end of 1916, all this had changed. Mine warfare on an unprecedented scale had transformed the landscape as if by the hand of God. Today, a visitor to Vauquois will see a small memorial, but no sign of the village. There are now two hills instead of one, the original having been divided in two by a series of enormous mine craters: industrial destruction on an unimaginable scale. By 1916, the Butte de Vauquois had become an important strategic position, as from the top all traffic to Verdun through the Islettes pass could be monitored. The Germans had actually taken the hill in 1914, and had immediately set about fortifying it. By 1915, the Butte had already been bitterly fought over, and a labyrinth had started to form under its bloody surface. The Great War is defined by the stalemate of trench warfare, but all along the Western Front, from Flanders to the Alps, a secret war was waged underground. The armies of all sides looked for a way around the bloody business of sending men over the top into ‘the storm of steel’ in No Man’s Land. The idea was to annihilate the enemy from beneath, allowing the infantry to rush forward and occupy the shattered land unopposed. First begun by the German 30th Pioneer Battalion in January 1915, the tunnel systems at Vauquois soon increased in complexity as each side tried to outdo the other. Listening tunnels were dug to intercept the enemy’s approaching diggers. Storerooms, antechambers, subways, command centres, and multiple entrances and exits were created. The French initially had the harder task, as they were on a gentler incline than the Germans, and had to dig vertically in order to create shafts into the hill. They named these shafts after Paris Metro stations, akin to the way that British soldiers named their trenches and tunnel systems after familiar locations, often with a heavy sense of irony and sarcasm. The resulting labyrinths could support about 1,000 men on either side, each racing to immolate the enemy first. On 14 May 1916, the Germans set off 60,000kg of explosives, the largest mine to be detonated at the Butte. It created a massive crater that today is some 80m in diameter and approximately 20m deep. During the war, it would have been much deeper, but as the years have passed, sediment has gathered and the area has grassed over. Even so, this and the series of other craters chill the blood of the visitor. Before the First World War, this sort of conflict landscape would not have been seen anywhere on Earth, and even today it is hard to comprehend. The shattered terrain at the Butte de Vauquois, where exploding mines remade the surface of the Earth in 1916. Photograph by Matt Leonard (CC-BY-NC-SA). at Vauquois was so bad that during late 1917 a short-lived and unofficial truce was declared between the two bitter enemies. The fighting had become unbearable, and in the end, the Germans tried to destroy the entire hill; a task that proved simply too great. Much of the old Western Front has been regenerated for the benefit of remembrance or tourism. This has led to many examples of trenches and dugouts being recreated in a sanitised and ‘acceptable’ manner. The history that they portray and the stories that they narrate are controlled and often dubious. At Vauquois, the history is raw, savage, and unedited. 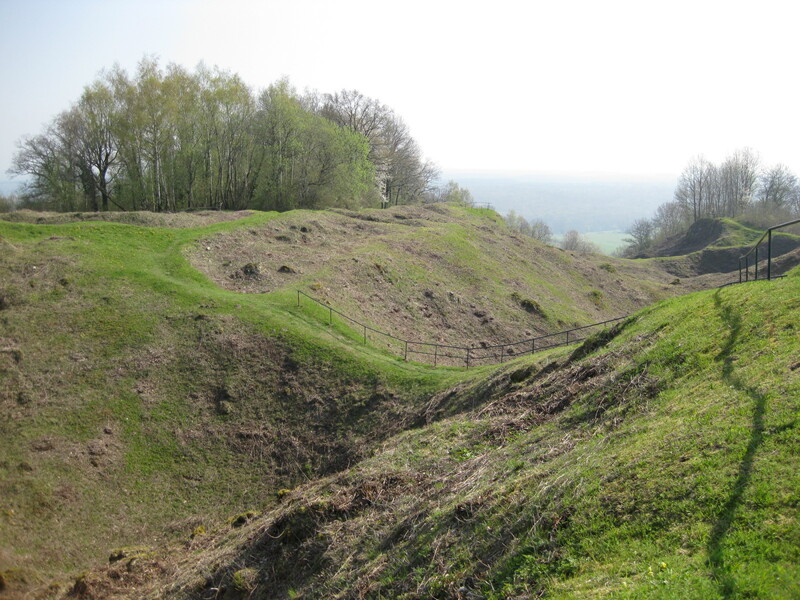 Apart from the growth of vegetation, the obvious clearance of the detritus of battle, and the addition of sparse railings around the vast craters, very little has changed at the site since the end of the war. Barbed-wire emplacements, trenches, entrances to tunnel systems, and the craters themselves tell the history of the abominable events that took place on this hill almost a century ago in a manner that few other First World War sites can. On the first Sunday of every month tours are run inside what is left of the hill. Beneath the giant craters are some 17km of tunnels on multiple levels. It is possibly the most thought-provoking and impressive tour that can be taken on the Western Front. The visitor gains a glimpse into a frightening and alien troglodyte world. The scale of the mining and counter-mining is hard to comprehend as the visitor rides the small mine carts through the claustrophobic and seemingly endless tunnels. The 519 mines detonated mean that it is extremely difficult to judge how many people lost their lives at Vauquois. Many men would have been atomised by the force of the blasts. But it is estimated that the site is the grave of at least 8,000 of the ‘missing’. It is also an official historic monument. This protected status means that the whole area can be seen in context. Many of the mine craters overlap each other, creating a giant scar across the landscape, and clearly define what happened at Vauquois. This differs, for example, from the Lochnagar crater at La Boiselle on the Somme. Here, only one of the mine craters from the 1 July 1916 remains. The Butte de Vauquois is far more than just an old battlefield. It is a shocking example of how modern warfare creates a terrifying world through the destruction it wreaks. It marks the end of battles that were fought on an open field for not much longer than a day. In the 100 years between the Battles of Waterloo and Verdun, warfare had changed immeasurably. Conflict was now waged above, on, and below the ground, with hugely powerful weapons, for months and years on end. Men lived and fought in the ground like animals, and destroyed each other in vast numbers. By 1916, industrial killing of both man and nature had become a norm. The Butte de Vauquois stands as a symbol of just how barbaric modern humans and modern warfare had become. 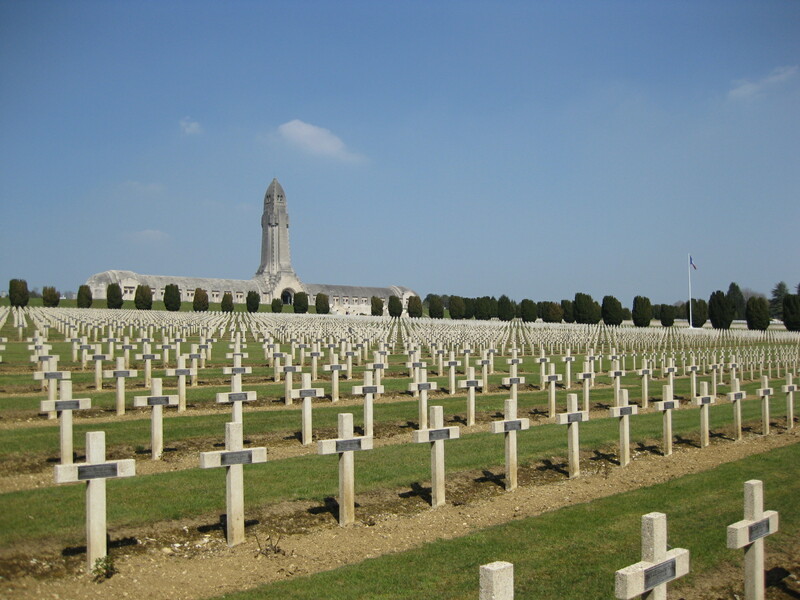 The Douaumont ossuary is a memorial containing the remains of soldiers who died on the battlefield during the Battle of Verdun in World War I. Photograph by Matt Leonard (CC-BY-NC-SA). This article was originally printed in The Military Times, March 2011. This entry was posted in From Space to Place and tagged 356 (Foot forces & warfare), 911 (Historical geography), 940 (General history of Europe), Blogs, UA (Armies: Organization - distribution - military situation), UD (Infantry). Bookmark the permalink. 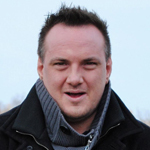 ← All Quiet on the Wikipedia Front?